Looking at getting a 45 ft macdon to put on my R76 and was wondering if I was going to have enough clearance to unload with the extender? Not sure about the unload auger but what about the weight. Can you lift it and the back end will need ballast. I have a 40' MD on my 88 and being light on the back end has never even came close to being and issue. According to MD website there is less than 500 pound difference between a 40 & 45 so weight is not an issue. Unload auger length will be. I have the extender on my 88, with the 40 ft head I can unload on the go pretty comfortably. If I get where the header is in line with the tire on the cart you need to be on your A game. With a 45 I think a man will need to be stopped to unload and you may not be able to hit the center of whatever you are dumping on like you want to. There are products out there to get the auger long enough to make it work, just not sure what the auger itself can stand for the added length. Be interesting for someone to try it and see. I have seen grain carts that have a conveyor belt on the right side of cart that moves back and forth to fill the cart, look like it hung abought 6 feet to right side of cart, that might be an option. I have a 40 foot Macdon on a S67 .No issues. The S series has a alittle more weight on the back end. Well I have a 30’ on a 66 and it got a little interesting on a few rolling hills with the head off the ground and going downhill and or turning. I learned fairly quickly how to do this the next time round. The 76 is same weight as a 66. If no hills, sure he’ll be okay. Some hills....might be another story. Gleaners were pushing around 12 row corn heads back in the N days so I find it hard to believe 45' would be an issue weight wise but I would like to know about the unloading auger, curious if you will be happy with reach. There are products out there to get the auger long enough to make it work, just not sure what the auger itself can stand for the added length. Be interesting for someone to try it and see. What products are you referring to? I have not seen anything longer than 30" that was comercially available. I would like 48" for my S67. 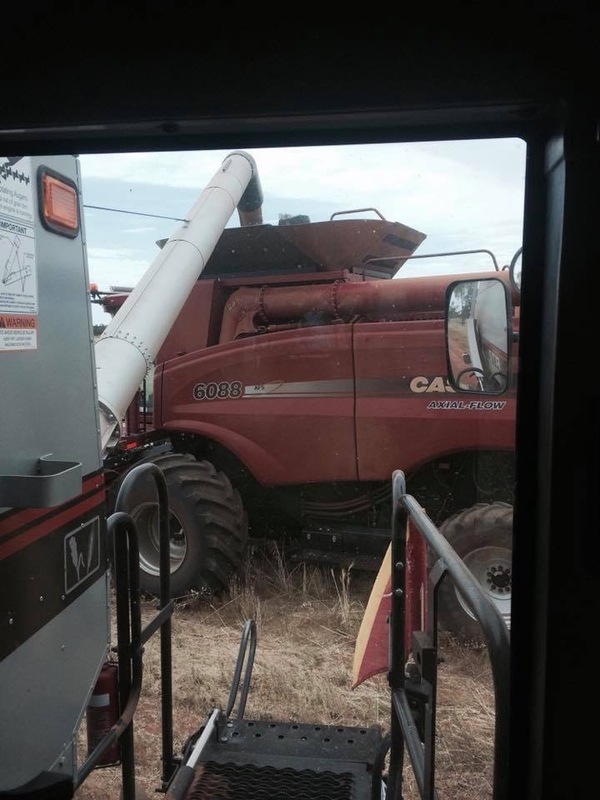 I saw a post on Facebook where an older Gleaner was unloading into a Flagship Case combine. He may have had more than a 48" extension. He had rigged up a strap as a support. The strap was somewhat loose when the auger was folded in but was tight when it was folded out. If I could combine something like that with a hydraulic or electric gate of some sort in the bin to clear the auger out so it was never folded or unfolded full of grain, I think I would be satisfied with the Gleaner auger. Last edited by dpilot83; 12-20-2018 at 08:43 AM.